I love to write in my journal. Every morning, I get up at 6 am, pour a cup of coffee, settle into my writing chair and reach for my journal and pen. Words tumble onto the page, sometimes slowly and deliberatively, other times in a steady flow of stream of consciousness. The only thing I ask of myself is to keep pen to paper until there are no more words. Sometimes, by the time I have finished the last drop of coffee, I will have written several pages. Other mornings, I might have written just a paragraph. Keeping a journal is a passion I developed at a young age. The diaries of my pre-teen years had soft pink covers and little-heart-shaped locks with keys. Invariably, I lost the keys. My entries covered the universe through the eyes of a young girl —from how much money I made babysitting to interesting butterflies and caterpillars I had caught. My promise to journal fizzled out four pages later. Fortunately, my journal has now become a constant companion and daily habit. 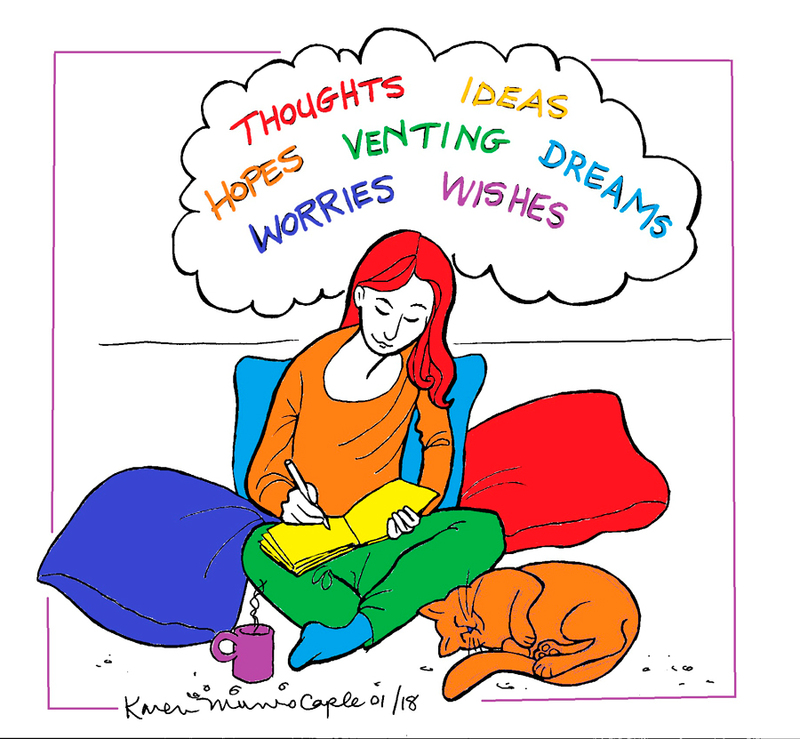 Journalling helps me think, work through issues and challenges, create and dream. Before the age of Twitter, Instagram and Facebook, where every moment of our lives are recorded, shared and commented on by scores of followers, keeping a journal or diary provided a place of private introspection where people expressed thoughts and feelings on paper. One of the world’s best-known and beloved diarists was Anne Frank, whose book, “The Diary of a Young Girl” was written at age 13 when she was in hiding for two years with her family during the Nazi occupation of the Netherlands. If you have never kept a journal, why not give it a try. To start, choose a nicely-bound journal just for your writings, and a special pen, both of which you will keep by the bed, couch or chair where you will write. Choose a specific time of day to write — first thing mornings is a good time before the mind gets active with mental lists of things to do; alternatively, right before you go to bed works well. The beauty of journalling is that you are writing for yourself so there is no need to worry about grammar and punctuations. And there are no rules for what to focus on. Some of my pages include writing, lists, poems and drawings. Our daily lives are filled with the many “to do” lists we have to get done —rush to class, drive to the office, grocery shop, take care of the kids and go to the dentist. Journalling is like taking a dip into an inner world. To journal is to practice solitude, learn how to be present with our own selves, and how to bear witness to our experiences. Journalling helps capture fleeting moments in a way that memory alone cannot evoke.